Another reason why PulseRecovery continues to achieve such an impeccable success rate is its team of Exchange server specialists. This team of experts have acquired extensive knowledge of recovering data from terabyte servers, like those used by large financial institutions, for example the City Group. UniRecovery has also developed, in collaboration with Pulse Technologies, a very unique and high-tech recovery tool for exchange servers. Fileservers, Application Servers, Mail Servers, Web Servers, NAS devices (Quantum SNAP, Dell Power Vault etc..) and just plain Servers form the backbone of many corporations' business records storage. There may be one hard drive or many, configured together in volumes spanning drives or striped across drives, on permanent hard drives or removable media. Windows NT and Windows 2000 are the most popular Operating Systems for servers today but we see many NetWare, Apple, Solaris, HPUX, and linux servers as well. UniRecovery Data Recovery Labs technicians are intimately familiar with server hardware from IBM, Compaq, Hewlett-Packard, Sun hardware as well as numerous others. Naturally, the individual media in Servers suffer from the same failure points as do drives in personal computers and workstations. 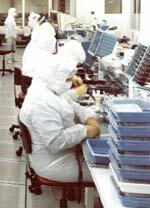 PulseRecovery Data Recovery Labs technicians treat Server and RAID loss situations as high priority cases. An initial diagnosis determines whether each media device is accessible to our lab equipment. If so, the first priority is to create a raw image of all data from accessible media onto UniRecovery media so that logical analysis can determine the nature of the data loss situation. Logical recovery uses the raw images of all the server's media by examining the low-level data sectors. Technicians must determine both the exact layout of volumes which span or are striped across multiple drives and what fixes to filesystem structures are needed to get access to the important data. Multiple-drive servers are typically 'destriped' onto PulseRecovery media so that filesystem repairs can be performed and the data files extracted. Sometimes the existing filesystem structures are missing or damaged so much that data has to be extracted directly from one or more fragments of the destriped image. PulseRecovery Data Recovery Labs programmers have created a full set of software tools used by our technicians to analyze, destripe, fix & recover data from raw image drives from all operating systems. Once a recovery has been successfully performed, file lists are created and data validity is checked. PulseRecovery's Labs have recovered from thousands of these devices over the years. As you may expect, no two data recovery scenarios are identical in all respects. Therefore, this uniqueness makes it impossible to give a realistic indication of pricing without knowing all the facts for a particular case. Generally speaking, pricing starts at about £1000.00 and goes up from this point. Over the phone, our highly trained Customer Service Consultants will be able to give you some idea of what pricing you would be looking at given your particular configuration and set of circumstances. Sending in your media for a no obligation evaluation will give us all of the information we would require to give you a firm quotation for the recovery of your data. PulseRecovery has geared its entire service to recover your data as fast as possible. When dealing with such a wide variety of problems, estimating time before the problem is diagnosed is difficult. That is why, each recovery case starts with a free evaluation. The free evaluation is started immediately on receipt of the media and generally takes 2 to 48 hours to complete. The process involves several hours of work and testing. Complete recovery turn-around time including analysis and recovery is usually between 1 and 5 days. Some severe cases can take considerably more time. Our hours of operation are 9am to 7pm Monday to Friday (All Labs), 9am to 5pm Saturday. If you have an emergency situation, we have technical staff on call for weekends and after hours in all locations. Time estimates are based on procedures and expertise required to recover the data you require. You are not charged by the hour. A firm quote is provided for your approval following the evaluation. AIX on IBM RS/6000 with jfs filesystems on LVM volumes. Collection of your damaged hardware (a supplementary cost may be charged depending on your location). Return of all your recovered data on a brand new hard disk (either supplied by you, or by PulseRecovery at an agreed cost). All About Recovery Planning: Why Plan? The primary objective of a Business Continuity or Disaster Recovery Plan is to enable an organization to survive a disaster and to re-establish normal business operations. Historically, the data processing function alone has been assigned the responsibility for providing continuity planning through a Disaster Recovery Plan, typically associated only with recovery of IT functionality. Frequently, this has led to the development of recovery plans to restore computer resources in a manner that is not fully responsive to the needs of the business supported by those resources. Business continuity planning is more comprehensive with a business operations focus rather than a data processing focus. In the past year, it has become clear that disaster recovery must include a business process oriented business impact analysis and a determination of what other systems are required to operate, such as: paper forms, skilled and knowledgeable people, special equipment, communications systems, work space and inventory. In today's environment, the effects of long-term operations outage may have a catastrophic impact. The development of a viable recovery strategy must, therefore, be a product not only of the provider's of the organization's data processing, communications and operations centre services, but also the users of those services and management personnel who have responsibility for the protection of the organization's assets. Defining how continuity planning considerations must be integrated into ongoing business planning and system development processes in order for the plan to remain viable over time. The successful and cost effective completion of such a project requires the close cooperation of management from all areas of Information Systems as well as business areas supported by Information Systems. Senior personnel from Information Systems and user areas must be significantly involved throughout the project for the planning process to be successful. What if I Don’t Plan? 70% of companies that suffer a major IT disaster, without a valid recovery plan in place, fail within the next year. Of those that do survive, only 10% make a full recovery. What do You Mean by a Disaster? Plan your response to a disaster. Disasters do not come with advanced warning and thinking it all through in advance and preparing a written procedural response to business resumption and recovery is the only prudent and responsible course of action. A written, well-prepared Business Continuity and Disaster Recovery plan is an absolute must for business success in our world today. Rapid Respond : in order to get you back up and running with the shortest possible delay. Data recovery from SCSI, RAID s, SANs or NASs servers, Mirrored and Striped Volume, Exchange Servers, RAID or NAS servers, backup tapes, floppy diskettes, Zip, Optical Media.